This post is BROUGHT TO YOU BY EVITE®, Coca-Cola® and NABISCO. 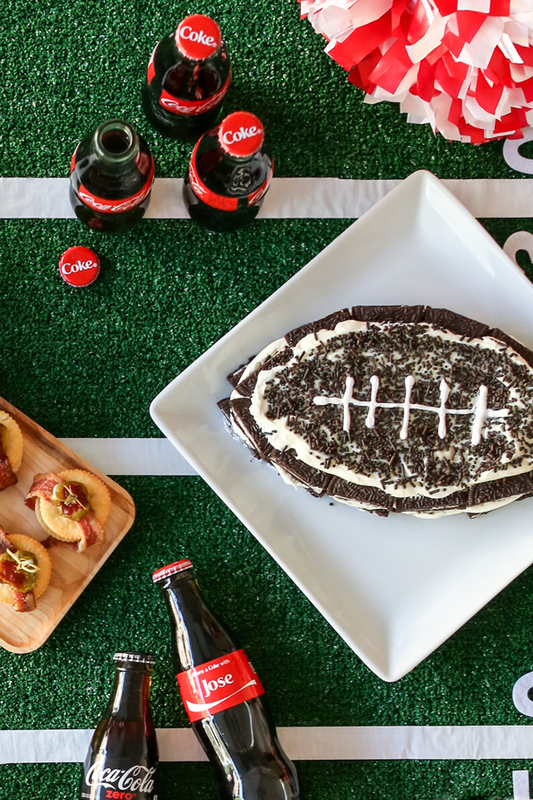 Football season is here and around our household that means Home Bowl party time! Today I’m sharing a delicious dessert and the perfect hostess gift idea with the help of Coca-Cola® and NABISCO! Who loves those personalized Share a Coke® bottles you see when you’re checking out in the grocery store line. Yes, I am guilty of digging through them endlessly to find my own name (which is difficult to find by the way). My sister surprised me one day and found a “Kari” bottle and I freaked out, saved it, and turned it into a little flower vase. Well, did you know you can order any name you want? Show up to your next Home Bowl party with personalized bottle with the hostess names on them. Best gift ever. Simply go to shareacoke.com to customize your Coca-Cola® bottles (just make sure you allow 2 weeks for delivery time)! Now onto an amazing dessert idea for the OREO Cookie fan. Who doesn’t love OREO Cookie’s right? Use a serrated knife to cut 16 cookies in half. 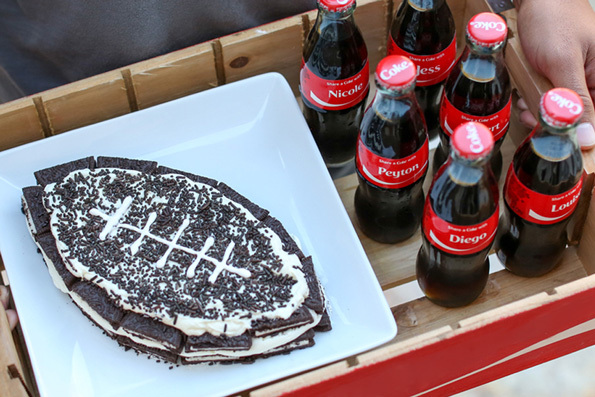 Arrange half the cookie pieces, cut sides out, in oval shape on platter to resemble football. Fill center with 10 whole cookies. Beat cream cheese in large bowl with mixer until creamy. Gradually beat in milk. Add dry pudding mix; beat 2 minutes. Gently stir in 1 cup whipped topping. Spread cream cheese mixture onto cookies on platter; top with remaining cookies. Cover with remaining whipped topping, then add sprinkles. Use icing to draw laces. The party ideas don’t stop here. Find many more Home Bowl ideas for an amazing party season! Football League. 1890717 ME. (C) “Coca-Cola” is a registered trademark of The Coca-Cola Company. (C) Mondelez International group.